In the middle of the Udaisagar lake of Rajasthan stands a five-star hotel. The 102-room hotel covers almost the entire 8 hectares (ha) of the island on the lake. The setting is picturesque, but it hides an ugly reality—a plethora of laws have been bent, circumvented and flouted by the state government over the past decade to allow the construction of the hotel. Every time residents of villages in the peripheral areas, or non-profits, filed complaints against Vardha Enterprise Private Ltd (VEPL), a Mumbai-based company building the hotel, it managed to get clearance from government authority or courts. But even officials now say that the clearances were “botched up”. In response to VEPL’s 2008 proposal to build a hotel on the island, the Urban Improvement Trust (UIT) of Udaipur, the body responsible for the overall development of the city, granted the company ownership over 8 ha of the island. But it allowed construction only in a little over 2 ha. The permission was on the grounds that 2 ha is available above the high flood level (HFL) of the lake. HFL is the highest water level which a water body can reach during the peak flow and is never submerged. The same year, UIT also converted the use of these 2 ha from “agriculture” to “commercial”. The rest, 6 ha, was supposed to be used for agriculture only. But a visit to the site reveals that a 4-m-high boundary wall has been built around the entire 8 ha. Even the current UIT chairperson, Ravindra Shrimani, agrees that laws have been transgressed. “The decision of former UIT secretary to change the land use on the basis of the irrigation department’s recommendation was wrong,” he says. R P Sharma, the UIT secretary who gave the permission, has retired from service. Village residents who lived and farmed on the island and who sold their land to VEPL are angry. “When we sold our land we did not know that a hotel would be built,” says a woman living near the lake, requesting anonymity. Babu Singh Devda, the sarpanch of Bichhdi, one of the affected panchayats on the periphery of the lake, says, “Farmers were cheated. The builders said they would improve agricultural conditions for us and we would farm the land together. But they have turned farmers into labourers.” Last year, residents of 14 villages launched an agitation against the hotel construction. The list of norms the builders and government officials have transgressed is quite long. According to the Master Plan of Udaipur, brought into force in 2003, the lake was classified as a “green area”, not to be used for commercial purposes unless there were compelling reasons. “How could UIT change land use without giving a compelling reason?” asks Tej Razdan, president of Jheel Sanrakshan Samiti (JSS), an Udaipur-based non-profit that has been fighting to save water bodies in the city. Hearing a public interest petition filed by JSS, the Rajasthan high court quashed the permission to build the hotel on September 27, 2012 (see ‘Gaining land’). It said the construction was liable to be dismantled. VEPL approached the Supreme Court and two years later the apex court set aside the high court order but permitted the authorities to take action against VEPL if it violated any law. The activists claim that the former UIT secretary R P Sharma did not present the full picture before the Supreme Court. The affidavit he presented stated, “The construction activity above high flood level is always permissible because it does not lead to encroachment on submergence area of lake...” After the Supreme Court’s approval, VEPL resumed work and encroached 0.33 ha government land. “The boundary wall has enclosed a very large area far beyond the sanction accorded,” reads a report of a five-member panel headed by C K Varshney, professor emeritus at Jawaharlal Nehru University, New Delhi. The panel was formed by the state government to study ecological impacts of the hotel on the lake and submitted its report in July 2017. “At least 49 species of phytoplankton, 40 fish, 5 frogs, 2 toads and 86 species of water birds are present in the lake. Its fauna also include 8 scheduled species protected under Wildlife (Protection) Act of India,” says the report. In fact, the lake is part of a system of interconnected lakes providing water security to the region. Rule 4 of the Wetland Rules 2010 and 2017 makes environment impact assessment (EIA) of a project mandatory if it is beyond 20,000 sq m. However, there was no EIA for the hotel, says JSS, because VEPL claimed the construction area was only a little over 19,000 sq m (1.9 ha). “The total construction area is under 20,000 sq m only on papers,” counters R C Rajput, member of JSS. “If one includes the allied structures, the construction area will cross the limit,” he adds. There is no information on how the hotel will treat its sewage. In their proposal, VEPL had said that they would set up a sewage management plant on the premises, but it is unclear if that has happened, says a UIT official, requesting anonymity. “If the hotel starts functioning, it will set a dangerous precedent. 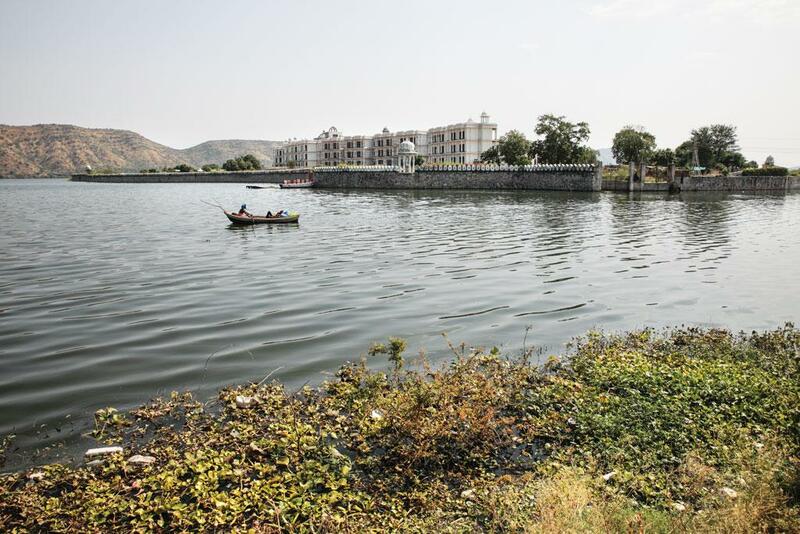 Builders are already eying sites within lakes,” fears Tej S Paliwal, a retired government official and member of Udaipur’s Lake Development Authority headed by the district collector. Activists say there has been a flaw in the legal process too. A Supreme Court bench headed by Justice M Lokur passed an order on February 8, 2017, which identified over 0.2 million wetlands of the country that require protection. The list includes Udaipur lake. On the other hand, another bench of the Supreme Court, headed by Justice J Chelameswar, enabled the construction of the hotel in its order in 2014. “Somebody has to file a petition to inform the court about this error and the case will move to higher bench,” says Supreme Court advocate Sanjay Upadhyay. Anil Mehta, joint secretary of JSS, has filed a petition, but it is yet to be admitted. Down To Earth’s attempts to contact VEPL for a response remained unsuccessful. Meanwhile, the hotel nears completion. Mar 28, 2016: Hearing VEPL's petition against the notice, SC says no coercive action against the company till further orders. Hearing on. May 12, 2016: The Supreme Court orders water department's chief engineer to look into the case, who approves all drawings presented by VEPL for road constructions. Aug 29, 2017: SC transfers an National Green Tribunal case related to Udaisagar lake and all the VEPL cases to itself. Hearing on. The article was first published in the November 16-30, 2017 issue of Down To Earth under the headline 'Nearly a lost cause'.